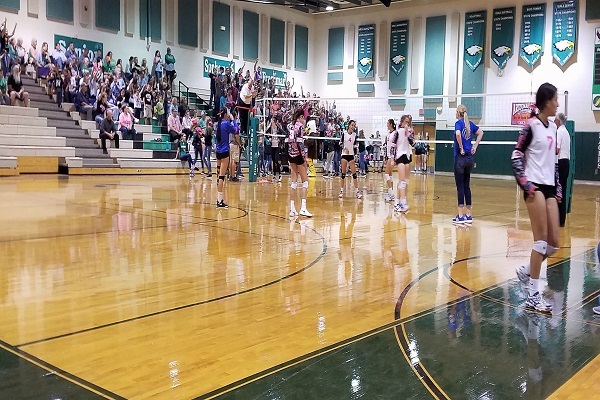 Thatcher needed a late rally in the third set to sweep Safford 3-0 in volleyball action Wednesday afternoon at Thatcher High School. Thatcher was systematic in the first set, winning 25-18. Tied at 6, the Lady Eagles rattled off 6 straight points capped off by a Mikaela Jorgensen kill to lead 12-6. Safford battled back to make it a 22-17 game last when back to back blocks by Kaitlynn Rasmussen and Madison Underwood set up set point for Thatcher. Safford started hot in set 2 lead by the right arm of Jessica Bright-Shade. The Lady Bulldogs led 4-1 before Thatcher’s defense showed it’s strength. The Lady Eagles blocked 6 Safford scoring attempts to take an 18-12 lead. Just like in game 1, an Underwood block set up game point for Thatcher and a service error by Safford gave the Lady Eagles set two, 25-18. In Set 3 Thatcher could sense the sweep and came out on fire. Taya Baldwin scored the first 5 points of the set before a Mia Carter block for Safford made it 5-1 Eagles. The set was back and forth as both teams traded points on long rallies. Safford powered through the Thatcher block with Outside Hitter Abigil Tellez to take 15-11 lead and Thatcher was forced to call time out. The break settled down the Eagles and they started to inch away at the Bulldog lead. Thatcher would make cut the lead to two with a Brooklyn Angle ace and Rasmussen would give Thatcher Match Point with a kill. Safford couldn’t respond on the next serve and Thatcher takes the match 3-0.